The U.S.-backed Syrian Democratic Forces (SDF), which is predominantly led by the PKK's Syrian affiliate, the People's Protection Units (YPG), ousted Friday the Daesh terror group from Raqqa's Old City, a spokesman told AFP, bringing them closer than ever to the terrorists' most well-defended positions. "Our forces today seized full control of the Old City in Raqqa after clashes with Daesh," SDF spokesman Talal Sello said. "We are on the edges of Daesh's security quarter in the city center, where most of its main bases are." Most of the Daesh terrorists and up to 25,000 civilians are expected to still be holed up in the city center. The SDF first broke into Raqqa in early June and penetrated its Old City a month later. They were able to enter it after U.S.-led coalition air strikes opened up two gaps in the Rafiqah wall, a 2,500-meter (2,735-yard) barrier surrounding the Old City. The SDF has captured more than 60 percent of Raqqa city and most of the surrounding northern province. Sello declined to say when the alliance expected to seize all of Raqqa, but said operations were proceeding "according to schedule". "Control over the Old City -- which has historical importance -- is a moral victory against Daesh, which is collapsing in Raqqa. Its defeat there is inevitable," he added. 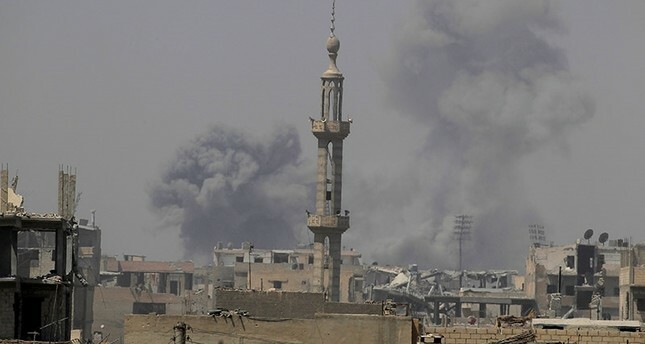 The Syrian Observatory for Human Rights, a Britain-based monitoring group, said the SDF was still locked in clashes with Daesh in a small part of the Old City. The U.S. support of the SDF, led by the YPG, and partnership in Syria operations has become a matter of dispute with Turkey, which underlines that one terrorist group cannot be eradicated by another.